This study investigated the cardiotoxicity of cisplatin (CIS) on rat heart by using the oxidative damage of the rat myocardium, troponin I and serum S100A1 levels. Previous studies have reported that cell-protective effect of Pycnogenol® (PYC) depended on its antioxidant and anti-inflammatory properties. Hence, the myocardial protective effect of PYC was investigated in this study. Rats were randomly grouped to four with 5 rats in each group. The groups were consisted of control group, PYC group: 10 mg/kg PYC for 7 days, CIS group: 15 mg/kg single injection of CIS on the 5th day, CIS + PYC group: 10 mg/kg PYC for 7 days, plus 15 mg/kg single injection of CIS on the 5th day. Heart and serum samples were acquired subsequently. CIS and PYC co-treatment group had increased catalase level (from 43.61±15.16 to 60.80±21.36, p<0.019) and prevented troponin I elevation (from 7.34±6.20 to 3.03±1.36). The S100A1 level was significantly reduced by CIS (from 10.25±8.8 to 3.99±2.87, p<0.035) and was restored by PYC treatment (32.07±29.23). Injured cardiomyocytes released troponin I after exposure to CIS and PYC, which can protect the cells from CIS cardiotoxicity, increased the tissue catalase level. Additionally, PYC treatment increased serum level of S100A1. Cisplatin (CIS) is an alkylating chemotherapeutic agent. It is first used by treating ovarian and testis cancers in 1978 (1). Today, CIS is used for the treatment of lung, larynx, oral cavity, oropharynx, salivary gland, germ cell tumors and lymphomas. Nephrotoxicity, neurotoxicity, ototoxicity, and cardiotoxicity are the known side effects of the drug (2). The most significant factors limiting its utilization are nephrotoxicity and cardiotoxicity that can occur acutely or cumulatively and by similar mechanisms (3). Pycnogenol (PYC) is obtained from pine tree (Pinuspinaster) shell and includes water-soluble bioflavonoids. PYC is used for medical conditions associated with oxidative stress such as renal and hepatic toxicity, tinnitus and diabetes mellitus (4-6). It was shown to protect against daunorubicin-induced cardiotoxicity by its antioxidant effect (7). However, it is not known whether PYC is protective against CIS cardiotoxicity. One-Way ANOVA was used for three or more group comparisons and the Tukey HSD test was used for multiple comparison tests. If the preconditions are not met, Kruskal Wallis and the Bonferroni-Dunn test from multiple comparison tests are used. Correlation analysis between two continuous variables was also used. Cardiac injury has been evaluated by oxidative damage on CIS-induced heart tissue. While troponin I is a well-known marker of cardiac injury, S100A1 originates in cardiomyocytes (8) and it is not clear whether its expression correlates with troponin or can be useful as a new marker of cardio-oncology. Several studies have been performed about the cardio protective effects of natural products and found as promising during the cancer chemotherapy (7,9). On the other hand, the natural product can behave as an adjuvant and might further increase the toxicity of antineoplastic medicine (10). Therefore, the aim of the study was to investigate the PYC’s efficacy and safety on CIS induced cardiotoxicity. The rats were weighed and after that they were randomly assigned to four groups with five rats in each group. Control group: Physiologic serum was given intraperitoneally for seven days and this was the healthy group. PYC group: PYC 10 mg/kg (gifted from Horpag Research Ltd Geneva, Switzerland) was given intraperitoneally for seven days, beginning from the first day. The dose was taken from a renal toxicity research (5). CIS group: CIS 15 mg/kg single injection (Platinol®, Bristol-Myers Squibb, İstanbul, Turkey) was administered intraperitoneally on the 5th day of the study. CIS+PYC group: PYC 10 mg/kg PYC was given intraperitoneally for seven days, beginning from the first day. Furthermore, 15 mg/kg single injection of CIS was administered intraperitoneally on the 5th day of the study. On the 8th day of study, under the anesthesia of Ketamine (50 mg/kg) and Xylazine (5 mg/kg), the blood was withdrawn by cardiac puncture, and the hearts were taken out immediately. Preparation of tissue samples: Rat hearts were homogenized for 10 minutes at 8000 rpm using a homogenizator over ice after weighing and cold chaining in a 50 mM phosphate tamponade (pH=7.0) (Heidolph, Silentcruster M, Germany). After homogenization, they were centrifuged with a refrigerator at +4 °C for 10 minutes and supernatants were kept at -80 °C (Hermle, Z 400 K, Germany). Tissue homogenate protein results were obtained as mg/dL with Abbott urinary protein kit using an autoanalyzer (Architect, Abbott). Aebi method based on kinetic measurement was used for diagnosis of CAT (11). It is measured by the reaction which gives rise to water and oxygen from hydrogen peroxide H2O2. In this study, CAT activity was detected as a decrease in H2O2 concentration in a time at 240 nm in a spectrophotometric (Dynamica Halo DB-20s, UK) analysis. Homogenates were diluted to a 1:5 dilution with 50 mM phosphate tamponade (pH=7.0). 1.00 mL H2O2 solution (30 mM) was added to 2.00 mL homogenate, and absorbance changes were recorded at 240 nm with 15-second intervals. Same procedures were reduplicated with randomized samples and activity, baseline and 30-second absorbances were calculated. Activity unit was reported as a ratio of obtained values to tissue protein level in k/mg. The blood was centrifuged (Hettich Zentrifugen, Mikro 200 R, Tuttlingen, Germany) at 10000 rpm for 10 min at 4 °C and the serum kept at -80 °C until the analysis. Serum troponin I level was established with immunoassay on Advia Centaur CP (Siemens, Germany) autoanalyzer. Rat serum S100A1 levels were established by using rat protein S100A1 ELISA kit (Cusabio Biotech, China) and studied on automatic Elisa plate reader (Biotech ELx800, USA). The optical density of each well was established within 5 minutes using a micro plate reader set to 450 nm. The results of tests were given as the number of observations (n), mean ± standard deviation, median and %25-%75 percentage values. In the decision of which statistical method to apply in the comparison of the study groups, the results of the homogeneity (Levene’s test) and normality tests (Shapiro Wilk) were used. Normally distributed and with homogeneous variances groups were compared independent three or more groups by Analysis of Variance. Multiple comparison tests, the Tukey HSD test was used. According to those tests results parametric test assumptions were not available for some variables, so the comparisons of three independent groups were performed by Kruskal-Wallis test. Multiple comparison tests, the adjusted Bonferroni-Dunn test were used. If the relationship between the two variables does not satisfy the parametric test prerequisites, the Spearman Rho correlation coefficient is used. Data were analyzed using SPPS 20 (IBM Corp. Released 2011; IBM SPSS Statistics for Windows, Version 20.0. Armonk, NY: IBM Corp.) Software. P<0.05 was used for statistical significance. PYC did not affect CAT activity on healthy tissue, and 15 mg/kg of CIS did not reduce CAT level when compared to the control group, but co-treatment of PYC and CIS significantly triggered the antioxidant CAT level up to 60.80±21.37 (Table 1). Serum troponin I level of CIS group was found elevated in the serum, and PYC was found to prevent the elevation. S100A1 level highly increased after PYC treatment (Table 1). 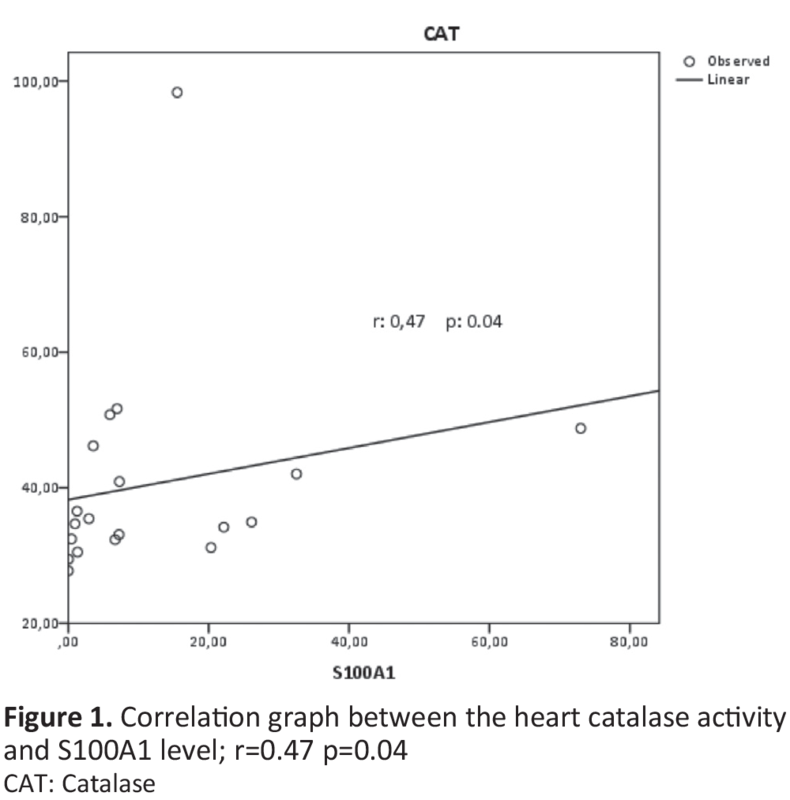 Heart tissue CAT level showed a positive correlation with serum S100A1 level; r=0.47 p=0.04. One is increasing, while the other is seen as an increasingly “moderate” statistically significant relationship (Figure 1). In our study, it was found that PYC did not have any effect on CAT activity in healthy tissues and CIS did not lead to the reduction of the CAT level. However, when PYC and CIS were used together, they were found to trigger the antioxidant CAT level. The S100A1 value, which was found to be positively correlated with the CAT level in the heart tissue, also increased following PYC treatment. As expected, serum troponin I level was found elevated in CIS group, and when PYC was added to the treatment, this value was reduced due to the positive effect of PYC. It might be expected that the adverse effects of drugs can be seen mostly in elimination organs such as liver and kidney. Moreover, the heart tissue is highly perfused; therefore, exposures to the drugs occur in high concentration. Due to technical problems, we were unable to assess the oxidant status such as the status of malondialdehyde (MDA) in the heart; however, El-Awady et al. (12) found that 10 mg/kg single dose of CIS significantly increased MDA level of heart tissue and proved that CIS is harmful to the heart tissue in animal study. Based on the tissue levels of CAT found in this study, the CIS 15 mg/kg was considered not to consume the CAT activity of the heart tissue severely; only troponin I level increased significantly as an early marker for cardiac injury. This increment was partially protected by PYC treatment together with increased CAT activity. In addition to its antioxidant, anti-inflammatory, and antiplatelet effects, PYC was also shown to decrease oxidative stress and improve the function from the endothelium in coronary arterial diseases (13). Feng et al. (14) investigated the effect of PYC on cardiotoxicity in mice treated with antineoplastic drugs. In their study with the experimental mouse - doxorubicin model, they showed that PYC did not antagonize the effect of the antineoplastic agent. When administered at 150 and 200 mg/kg orally, PYC was found to prevent doxorubicin cardiotoxicity by inhibiting the elevation of creatine phosphokinase in the serum (14). The results related to levels of serum CAT and troponin I obtained in our rat model with CIS support this study. The CIS-related cardiac dysfunction is due to the disruption of the mitochondrial membrane as well as the ultrastructural abnormalities seen in mitochondria. It was shown that, following CIS treatment, the endoplasmic reticulum stress response and apoptosis were increased in cardiomyocytes (15). CIS was shown to lead to renal injury by triggering the formation of mitochondrial reactive oxygen species in renal tubular cells (16). Since toxicity occurs with a similar mechanism, the antioxidant treatment targeting mitochondria was reported to be protective against CIS-related cardiotoxicity and nephrotoxicity (17). On the other hand, it was reported that S100A1 is rich in cardiomyocytes (8) and it is found in extracellular compartment following heart ischemia (18). The other member of S100 family, S100B protein expression was suggested as a new forensic marker for cocaine-induced heart injury (19). The crucial role of S100A1 for cardiac performance and contractility was reported (20,21). In our study, reduced release of S100A1 from injured cardiomyocytes to serum after CIS exposure was demonstrated, which was concordant with our previous study (22). Lapatinib and trastuzumab decreased S100A1 expression in a ratio of %75. In our study, we did not report any correlation between S100A1 and troponin I. Moreover, a positive correlation was found between S100A1 and CAT activity. A raised level of S100A1 due to the concomitant application of PYC and CIS may give rise to the hypothesis of the beneficial effect of PYC together with anticancer drugs for decreasing cardiotoxicity. Studies using PYC to prevent cardiotoxicity in patients using cardiotoxic oncologic agents may be important in the future. Single dose of CIS 15 mg/kg was enough to produce myocardial damage, as proven by troponin I level in this experimental rat model. We demonstrated that PYC treatment partially prevented the detrimental effect by increasing CAT activity which is in correlation with S100A1. Acknowledgement: We wish to thank Horpag Research Ltd. (Geneva, Switzerland) for gifting us the Pycnogenol®. Ethics Committee Approval: Adnan Menderes University (ADU, Aydin, Turkey), Animal Ethical Committee (64583101/2013/037). Informed Consent: Since it is an experiment on animals, there is no need for informed consent. Surgical and Medical Practices: B.D., S.A., Concept: U.E., B.D., Design: U.E., B.D., Data Collection or Processing: B.D., U.E., S.A., Analysis or Interpretation: U.E., B.D., S.A., Literature Search: U.E., B.D., Writing: U.E., B.D. Finacial Disclosure: The research received no specific grant from anywhere. There is no financial disclosure. Prestayko AW, D'Aoust JC, Issell BF, Crooke ST. Cisplatin (cis-diamminedichloroplatinum II). Cancer Treat Rev1979; 6: 17-39. Loehrer PJ, Einhorn LH. Drugs five years later. Cisplatin. Ann Intern Med 1984; 100: 704-13. Varga ZV, Ferdinandy P, Liaudet L, Pacher P. Drug-induced mitochondrial dysfunction and cardiotoxicity. Am J Physiol Heart Circ Physiol 2015; 309: 1453-67. Luzzi R, Belcaro G, Hu S, Dugall M, Hosoi M, Cacchio M, et al. Improvement in symptoms and cochlear flow with pycnogenol in patients with Meniere's disease and tinnitus. Minerva Med 2014; 105: 245-54. Parveen K, Khan MR, Siddiqui WA. Pycnogenol prevents potassium dichromate K2Cr2O7-induced oxidative damage and nephrotoxicity in rats. Chem Biol Interact 2009; 181: 343-50. Yang YS, Ahn TH, Lee JC, Moon CJ, Kim SH, Jun W, et al. Protective effects of Pycnogenol on carbon tetrachloride-induced hepatotoxicity in Sprague-Dawley rats. Food Chem Toxicol 2008; 46: 380-7. Mojzisova G, Mirossay L, Kucerova D, Kyselovic J, Mirossay A, Mojzis J. Protective effect of selected flavonoids on in vitro daunorubicin-induced cardiotoxicity. Phytother Res 2006; 20: 110-4. Donato R. Functional roles of S100 proteins, calcium-binding proteins of the EF-hand type. Biochim Biophys Acta 1999; 1450: 191-231. Vincent DT, Ibrahim YF, Espey MG, Suzuki YJ. The role of antioxidants in the era of cardio-oncology. Cancer Chemother Pharmacol 2013; 72: 1157-68. Dirican A, Sahin O, Tasli F, Sogut E, Kucukzeybek Y, Alacacioglu A, et al. Thymoquinone enhances cisplatin-induced nephrotoxicity in high dose. J Onc Sci 2016; 1: 17-24. Aebi H. Catalase. In: Bergemeyer HU, editor. Methods of Enzymatic Analysis. New York - London: Academic Press; 1974.p. 673-84. El-Awady el SE, Moustafa YM, Abo-Elmatty DM, Radwan A. Cisplatin-induced cardiotoxicity: Mechanisms and cardioprotective strategies. Eur J Pharmacol 2011; 650: 335-41. Enseleit F, Sudano I, Periat D, Winnik S, Wolfrum M, Flammer AJ, et al. Effects of Pycnogenol on endothelial function in patients with stable coronary artery disease: a double-blind, randomized, placebo-controlled, cross-over study. Eur Heart J 2012; 33: 1589-97. Feng WH, Wei HL, Liu GT. Effect of PYCNOGENOL on the toxicity of heart, bone marrow and immune organs as induced by antitumor drugs. Phytomedicine 2002; 9: 414-8. Ma H, Jones KR, Guo R, Xu P, Shen Y, Ren J. Cisplatin compromises myocardial contractile function and mitochondrial ultrastructure: role of endoplasmic reticulum stress. Clin Exp Pharmacol Physiol 2010; 37: 460-5. Zsengeller ZK, Ellezian L, Brown D, Horvath B, Mukhopadhyay P, Kalyanaraman B, et al. Cisplatin nephrotoxicity involves mitochondrial injury with impaired tubular mitochondrial enzyme activity. J Histochem Cytochem 2012; 60: 521-9. Mukhopadhyay P, Horvath B, Zsengeller Z, Batkai S, Cao Z, Kechrid M, et al. Mitochondrial reactive oxygen species generation triggers inflammatory response and tissue injury associated with hepatic ischemia-reperfusion: therapeutic potential of mitochondrially targeted antioxidants. Free Radic Biol Med 2012; 53: 1123-38. Donato R, Cannon BR, Sorci G, Riuzzi F, Hsu K, Weber DJ, et al. Functions of S100 proteins. Curr Mol Med 2013; 13: 24-57. Faa A, Senes G, Locci A, Pampaloni P, Pais ME, Piras B, et al. S100B protein expression in the heart of deceased individuals by overdose: a new forensic marker? Clinics (Sao Paulo) 2012; 67: 821-6. Most P, Seifert H, Gao E, Funakoshi H, Völkers M, Heierhorst J, et al. Cardiac S100A1 protein levels determine contractile performance and propensity toward heart failure after myocardial infarction. Circulation 2006; 114: 1258-68. Duarte-Costa S, Castro-Ferreira R, Neves JS, Leite-Moreira AF. S100A1: a major player in cardiovascular performance. Physiol Res 2014; 63: 669-81. Eryilmaz U, Demirci B, Aksun S, Boyacioglu M, Akgullu C, Ilgenli TF, et al. S100A1 as a Potential Diagnostic Biomarker for Assessing Cardiotoxicity and Implications for the Chemotherapy of Certain Cancers. PLoS One 2015; 10: e0145418.